WE ’RE CONFIDENT PEOPL E. W E UNDERSTAND THE TALENT AT OUR DISPOSAL. Before Daryl Hall and John Oates go on stage, they spend an hour together with their backing band, telling stories from their golden years. It relaxes everyone, loosening them up so their playing isn’t stiff in front of 10,000 people. It also gives Daryl and John an excuse to hang out. “A lot of times stories just fall out, that the other one of us has totally forgotten,” laughs Daryl. “John will tell a tale and I’ll go, ‘Oh yeah, that happened! If that gives the impression Daryl Hall & John Oates took advantage of every excess the 1980s had to offer, it ignores the steely determination that the pair share. You don’t get to create timeless classics like I Can’t Go For That, Maneater and Private Eyes if you’re swimming in hookers and coke. “Our strong work ethic is something that unites us,” notes Daryl. “We’re very dedicated to our craft and our creativity. 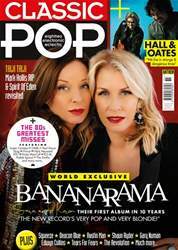 Find the complete article and many more in this issue of Classic Pop - Apr 2019 - Bananarama! Single Issue - Apr 2019 - Bananarama! Issue 51 of Classic Pop is on sale now! This month, we have an exclusive interview with Bananarama's Sara Dallin and Keren Woodward as they return with their first new studio album in a decade. We also meet iconic duo Hall & Oates before their UK arena tour and talk to Gary Numan as part of our look into the superfan phenomenon. Classic Pop pays tribute to the wonderful Mark Hollis from Talk Talk and we celebrate the band's iconic Spirit Of Eden in our latest Classic Album feature. Squeeze's Glenn Tilbrook and Chris Difford take us inside their spiky songwriting partnership and we also hear from Happy Mondays frontman Shaun Ryder about his life as a one-of-a-kind wordsmith. Our packed new album reviews section includes Bananarama, Edwyn Collins, Toyah, Andy Bell and The Chemical Brothers. On the reissues front, we revisit New Order's debut album Movement plus re-releases from Prince, Kate Bush, R.E.M, David Bowie and more. In our live reviews section, we elbow our way down to the front for Tears For Fears, The Revolution, Holy Holy and Bryan Adams. Enjoy the issue!